PositiveSingles.com is the largest herpes and STD dating site, which has over 1,212,200 active positive singles. The website focuses on STD & herpes dating service since 2001. It has been reported by Forbes, AOL, etc. 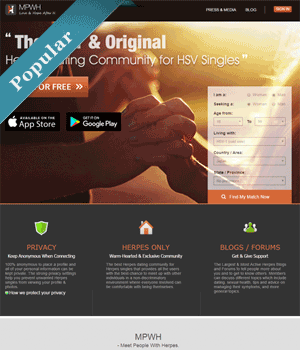 Although it's an STD dating site, the number of herpes(HSV) singles on this site take up to 70% of the total members. Members on this STD dating site are very active and friendly. Moreover, it has the highest success ratio of finding love on this site due to its members' serious attitude on seeking love. PositiveSingles has helped tens of thousands of herpes singles finding their matches. The premium membership fee is $29.95 per month. Positive Singles offers IOS and Android dating apps for its mobile users. The herpes dating apps are well designed and easy to be used. Moreover, the unique “Let’s Meet” feature on its dating apps can help herpes singles find their match by swiping left or right quickly. To be honest, PositiveSingles might be not the perfect one, but it is Undoubtedly the no.1 STD dating site so far, Maybe, the only place needs to be improved is extending the Live Dating Advisor time. Currently, the Live Dating Advisor time is only 2 hours every day from 6:00 PM-8:00 PM EST. MPWH.com is one of the popular dating sites only for people who are living with herpes (HSV-1 and HSV-2). It is also well known as Meet People with Herpes. It has more than 200,000 members around the world and the majority are from the United States. MPWH used to be a totally free herpes dating site. Members on this dating site were very active due to it's free. However, in March of 2016, it started to charge members for its premium dating service. There is no limitation for people to browse profile, post blog and reply to paid member's email. However, if you want to initiate an email, you need to upgrade to the gold member. The membership fee is $29.95 per month. It is same with PositiveSingles'. 1. Compared with Positive Singles, the members on this herpes dating site are not enough. H-Date.com is a free herpes dating site that offers dating service and support for people living herpes and HPV. 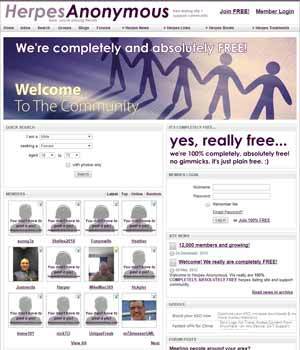 It claims itself as the world's largest free herpes dating, HPV dating, and support site. The registration progress of H Date is simple. You only need to fill the basic information to complete the profile. There are 43,098 registered members. It’s worth mentioning that the features “voting poll” and “member hot list” can let its member vote and check the most attractive members. 1. The design -the site's design is poor. 2. Advertisement – the site has the commercial advertisement from Google Adsense. 4. Through it claims they are herpes and HPV dating site, they also accept users with any other STDs, including HIV positive singles. Herpespassions.com was founded in 2004. It is one of the oldest online dating & social networking website specifically for singles who living with herpes. It is one of the 100% free herpes dating sites where you can chat and sent messages free. Herpes passions also offer the feature that members be allowed to join an online network, where they can select other dating sites that are connected, in accordance with their interests. 1. Bad user experience – the layout of the site makes users feel uncomfortable; the registration of progress is too complicated. 2. Having commercial advertising – the website provides commercial advertising from Google AdSense. 3. Members on this herpes dating site are not active enough – Maybe due to the bad user experience, the members of the site are not active even though it is one of the oldest herpes dating websites. HerpesAnonymous is a completely free dating site and community for HSV singles. It was founded in 2008, which is one of the oldest free herpes dating sites. HerpesAnonymous offers herpes groups, herpes blogs, herpes forums and herpes news for HSV singles. Since it is a totally free herpes dating site and community, the site owner did not spend much time and money to do promotions. After 20 years, it is still a very "small" site. More ever, since it will take some days for the site owner to approve your account, you can not do anything before that. That makes the users on the site inactive. People probably forget they have an account on this site after several days later. That is a big problem. Through it is a free herpes dating site, the privacy protection work is better than HSVSingles and other free herpes dating sites. People can not view anything unless they become a member. Once you registered your account, you will be held for approval. The website claimed that they need to view your profile and make sure everyone is real. All in all, this herpes dating site did a good job in users' privacy protection. 2. Lack of enough members - I found less 100 members in some states. 3. Users are not active- you probably won't get any response after sending tens of messages. 4. Although this free herpes dating site did some work on protecting users' privacy, users' profile photo still can be viewed on the homepage.